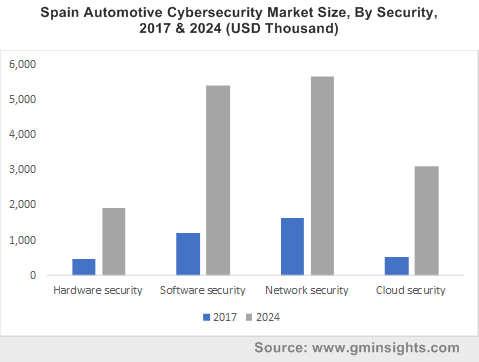 Automotive Cybersecurity Market size estimated at USD 187 million in 2017 and is anticipated to grow at a CAGR of more than 23% from 2018 to 2024. The increasing demand for connected vehicles is driving the growth of the automotive cybersecurity market. As of 2016, the number of connected vehicles on the road was approximately 28 million and is projected to reach around 70 million by 2020. These systems deliver enhanced comfort and convenience for customers and help in accomplishing societal goals such as reduced fuel consumption, improved road safety, and traffic & parking management, offering an overall interconnected driving experience. The connected cars are also witnessing huge innovations in terms of safety assistance technology and infotainment systems. Hence, with the increase in the demand for connected cars, there is a high probability of attacks in various parts of the automobile. ECUs form an integral part of connected cars with the presence of around 70 ECUs in an average modern car, over 100 ECUs in high-end cars, and about 150 ECUs in luxury cars. These ECUs assist in reducing the complexity of the systems and simplify automobile communication. However, these ECUs are susceptible to a large number of cyber-attacks as they are exposed to multiple external networks such as LTE, GSM, Bluetooth, and Wi-Fi. The network security accounts for the highest share of 36.4% in the automotive cybersecurity market as attacks exist both in the internal as well as external networks. Over the forecast period, millions of connected vehicles are estimated to be on the roads, increasing the probability of attacks in the network interfaces. These include Bluetooth, on-board diagnostics, Wi-Fi, dedicated short range communication (DSRC), and mobile 4G/5G for V2X communication. The hackers are able to get access through the third-party communication in connected cars. Hence, it is necessary to ensure network security through restricted device management accessibility in vehicle terminals. The cloud security is the fastest growing segment in the automotive cybersecurity market and is growing at a CAGR of 29.4% over the forecast timeline. Due to the increase in the number of cloud-connected vehicles, the cloud-based services are also rapidly rising. They offer passengers and the drivers various services ranging from navigation to V2V and V2I communications, avoiding accidents. Hence, to make these services available, the vehicles rely on two-way information sharing, making it important to secure cloud technology, protecting the lives of the passengers, drivers, and pedestrians. The passenger/consumer vehicle segment dominated the automotive cybersecurity market with a market holding of around 89.9% in 2017. The growing amount of in-vehicle connectivity including infotainment services, mobile phone connectivity, navigation, voice recognition, and communication with several other vehicular infrastructures drives the market growth. As this connectivity is vital for satisfying the consumer demand, it also introduces huge vulnerabilities, assisting hackers to exploit and gain control of the passenger vehicles and access to the private consumer data gathered by the vehicles. As the investments in connectivity and digitalization are anticipated to rise over the forecast period, OEMs need to implement a comprehensive cybersecurity approach, aimed at maintaining the cybersecurity in passenger vehicles. With a market share of 36.2% in 2017, the communication segment dominated the automotive cybersecurity market due to the rising deployment of technologies in modern vehicles. The vehicle2vehicle (V2V) technology permits vehicles on the road to communicate with other vehicles and share data regarding road conditions and various other factors through the network created among vehicles. This connected car technology assists the drivers in avoiding car crashes and reduce traffic congestions and environmental degradation. It is anticipated that by 2023, all the vehicles on the roads will install the V2V technology. This advanced communication technology requires an enhanced level of security from the cyber attackers, boosting the automotive cyber security market growth. The On-board Diagnostics (OBD) segment is projected to grow at the fastest rate over the forecast period as these devices are being actively used by fleet managers, usage-based insurance providers, and consumers. As these ports provide a direct access to the most sensitive, internal, and critical systems in automobiles, they are highly prone to hacking, requiring higher cyber safety measures. North America held around 51.8% of share in 2017 in the global automotive cybersecurity market. The rising demand for automobiles in this region due to the convergence of automotive sector and ICT has resulted in the advent of the connected vehicle ecosystem. Moreover, the Department of Transportation in the U.S. is urging various automotive firms to share critical information and co-operate with researchers to deal with the potential car hacking attacks. The government in this region is also investing to increase the automotive cybersecurity. The Asia Pacific automotive cyber security market is projected to grow at a CAGR of 33.3% over the forecast period. The enhanced usage of wireless network systems and in-vehicle infotainment systems have accelerated the sales of connected vehicles in China, driving the complete Asia Pacific market growth. Furthermore, improved research in the intrusion detection systems and growing integrated software in the modern vehicles will fuel the market growth. 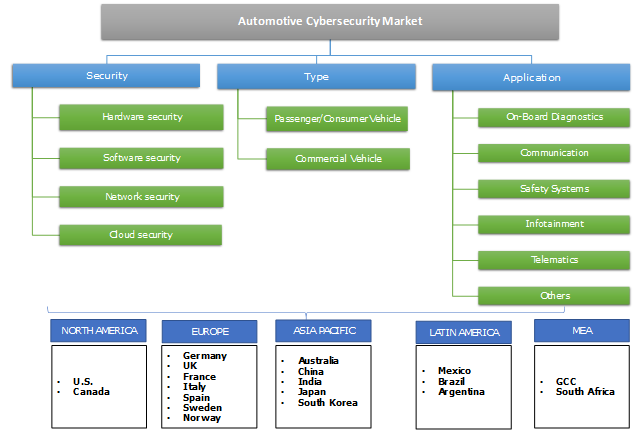 The global automotive cybersecurity market is characterized by the presence of a large number of eminent automakers and software security providers. Various leading capital venture firms are also investing in companies offering automotive cybersecurity solutions to enhance their services offerings and deliver safe security solutions. Some of the key players operating in the market are Audi, Argus Cyber Security Ltd., Arilou Technologies Ltd., BMW, BT Security, Cisco Systems, Inc., Continental AG, Karamba Security, Symantec Corporation, Daimler Trucks, Ford, GM, Honda, Nissan, Tesla Motors, Volvo Car Group, and Lear Corporation. The introduction of automotive cybersecurity has opened new boundaries into the business world in terms of passenger safety and enhanced environmental protection. The governments across the world are taking effective steps by implementing stringent rules and regulations to improve the vehicular cybersecurity.